With a goal of transcendent awareness, John Shea presents this commentary on the Sunday Gospel readings for those who are drawn to the spiritual wisdom of the Gospels. Ideal for Christian preachers and teachers, and Christians who meditate on the Gospels, Shea's book takes a literary-spiritual approach. He analyzes the mindsets of characters and how Jesus complimented, critiqued, praised these mindsets, to inspire meditation, reflection, and spiritual development. Eating with the Bridegroom, Year B is the second book of a four-volume set, The Spiritual Wisdom of the Gospels for Christian Preachers and Teachers. This set is a Lectionary-based resource that references both Roman Catholic and Revised Common Lectionaries, making it useful and interesting to various Christian denominations. A Scripture index makes Shea's insightful reflections accessible for personal reflection on the Gospel texts as well as other uses outside of liturgical preparation. 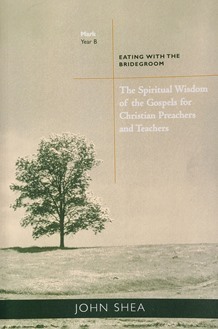 With wisdom relevant to our contemporary world, The Spiritual Wisdom of the Gospels for Christian Preachers and Teachers: Eating with the Bridegroom will find its way to the top of your resource list. John Shea, STD, is a theologian, author, and storyteller who lectures nationally and internationally on storytelling in world religions, faith-based health care, contemporary spirituality, and the spirit at work movement. All people will benefit from the book, not only teachers and preachers, but also catechists, parents and presiders, who seek the Holy Spirit's power in their lives. Unlike most lectionary commentaries this book is not an exegesis of the biblical passages as such, but each gospel text becomes a focus of Shea's characteristically wise and engaging reflections on the connection of the gospel stories to our experience. Because of this the volume can serve as rich spiritual reading as well as offering leads for preaching and teaching. People in the pews will welcome this weekly challenge of the spiritual wisdom of the Gospel texts. Shea helps Jesus the teacher come alive for this generation. Another marvelous volume by gifted spiritual writer John Shea. For those whose spiritual discipline concentrates on the lectionary readings, this will be another excellent guide. An invaluable resource for presiders and people, parents, teachers, catechists, and all who desire the Spirit's `pleasure, passion, and purpose' in their lives.